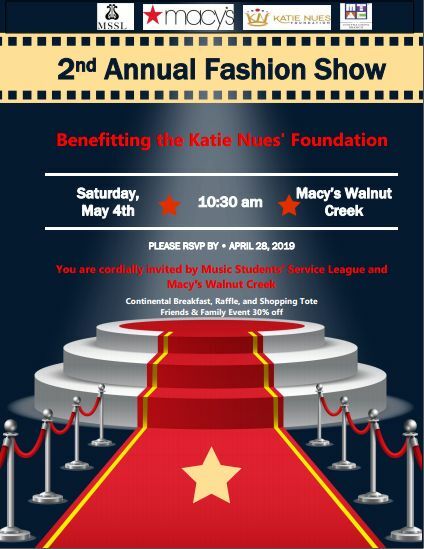 Saturday, May 4, 2019 10:30 a.m.
MSSL and Macy's 2nd Annual Fashion Show at Macy's Walnut Creek, 1301 Broadway Plaza, Walnut Creek. Macy’s is donating $5,000 to the Katie Nues Foundation. Thursday, May 16th, 2019 10:00 a.m.
Thursday, May 2nd, 2019 10:30 a.m. The Music Teachers' Association of California (MTAC) is a musical organization, founded in 1897, to promote and encourage the highest standard in music education. We are comprised of 61 branches and nearly 4,700 members statewide. 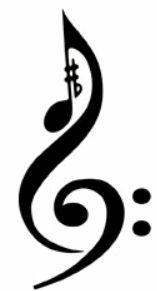 CCMTAC, the Contra Costa Branch of the Music Teachers' Association of California, is a professional organization dedicated to the pursuit of excellence in music education. The Contra Costa Branch, established in1949, has over 130 members. We offer programs for students to make a positive impact on the quality of music education such as the Sonata Festival, Baroque Festival, branch recitals and masterclasses as well as involvement in community outreach through the Music Students’ Service League. Programs for members inspire quality teaching and continuation of teacher education through lectures and masterclasses sponsored by our branch. State programs for students include the Certificate of Merit, VOCE and opportunities to perform at the annual State MTAC Convention.